Recently I signed up for a class on Japanese patina techniques. Instead of making test swatches, I decided that I should make practice artwork in various alloys to receive the patinas. I settled on spindle whorls for drop spindles , as they are small and show off both inlay and patinas well. I made the staves from standing dead Port Orford Cedar, from near Gold Beach, OR. The class was taught by Momoko Okada, and I found it both enjoyable and very informative. I cast the ingot for this whorl in water, from shibuichi, an alloy of 25%silver and 75%copper. I forged and trimmed the shape, and then hammer thickened the edges. With a pivoting template I scribed a sunflower seed pattern on the bottom. On the top of the whorl I cut a herringbone twill pattern, and inlayed silver and gold foils in the shape of a sunflower. Before the patina the shibuichi looked like tin bronze, but after took a rich pewter color. I was concerned that this might not contrast well with the silver inlay, but I found that after soaking the work in grated dikon radish befor the patina bath, this was not at all a problem. This is a light weight whorl I made of yellow brass, 30%zinc and 70%copper. I carved apple blossoms and little green apples top and bottom. After scribing a concentric background top, and a radial background bottom, I hammer thickened the edge, and inlayed a silver flower petal falling from the apple blossoms. Good patinas on brass are dificult, and I am quite happy with the rich dark color I was able to achieve. I forged this whorl from copper, and hammer thickening only the inside curves. I scribed the bottom using a pivoting template to create the fan shaped pattern on the lobes. The trillium pattern on the top, I inlayed in silver. The patina was a bath of copper salts, which produced a rich leathery color, which I set off with a little lampblack. I cast the ingot for this whorl from kuroshibuichi, an alloy of 5%silver and 95% copper, which takes a lovely dark patina. After forging and carving the form, I inlayed raised silver dots on the top, and a gold beetle on the bottom. After forging this whorl from copper, I hammer thickened the edge, and scribed the pattern on the bottom with a pivoting template. The inlayed dots on the bottom are silver, while the spider is shakudo, and alloy of 3% gold and 97% copper; the spider’s eyes are gold. I then engraved the web, and legs of the spider. The copper took a lovely terracotta color in the patina bath, while the shakudo went black. I forged this whorl from shakudo, an alloy of 3% gold, and 97% copper, taking great care not to remove the pure copper casting skin that formed on the surface. I then stoned the top smooth, and hammer thickened the edge, so that they would become black with patination. On the bottom I inlayed a thick block of silver, and carved it down to form the maple seed. I then carved the branch on the top, and inlayed the gold leaves. I was very pleased with the variety of colors I was able to get out of a single patina bath. Not long ago the Strait of Georgia, Strait of Juan de Fuca, Puget Sound, and nearby coastal waters were collectively named the Salish Sea. At about that same time the price of gold went so high that no one was ordering gold jewelry. Out of frustration with the lack of orders, and to commemorate the naming, I beat my 18K scrap into this gold cup, and tooled a stylized map of the Salish Sea around its sides. Because the sides of the cup are conical the directions shift as you go around the cup. On this side of the cup north is straight down, and you can see the Kitsap Peninsula, just to the left of center. Vancouver Island and coastal BC wrap around the far side of the cup. The lid and cradle are hand raised, fabricated, and planished with oriented blows from a modified cross-pien hammer. The feet and handle are cast using the fluid wax reticulation process. A decorative threaded nut at the bottom secures the cup to its feet. The eggshell is lined with food grade resin so it can, if desired, be used as a drinking vessel. I made this Hors d’ouvres set as a companion to the egg cup, the tray is raised and planished in the same fashion as the fabricated parts above, and again the handles are done using the fluid wax reticulation process. The spoon and fork are included in the set. 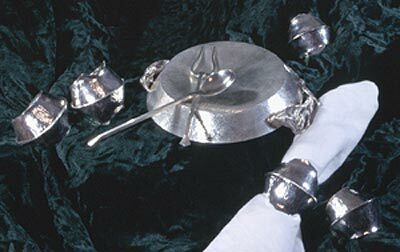 The napkin rings are heavy fold forms and made to compliment my other hollowware. They are available in sets of three. 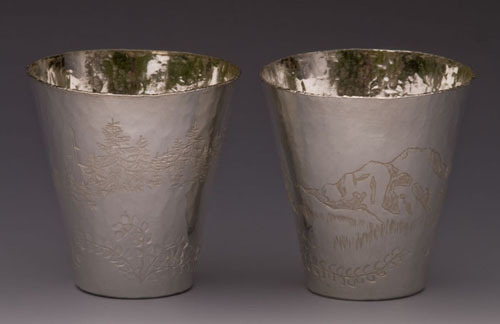 These two little cups were raised from sheet that was beaten from ingots, and then chased with stylized landscapes that run all the way around. The cup on the left shows Mt. Hood with Douglas Firs, while the cup on the right shows Mt. Rainier with Western Hemlocks. They are each of a size to hold a double shot of whisky. 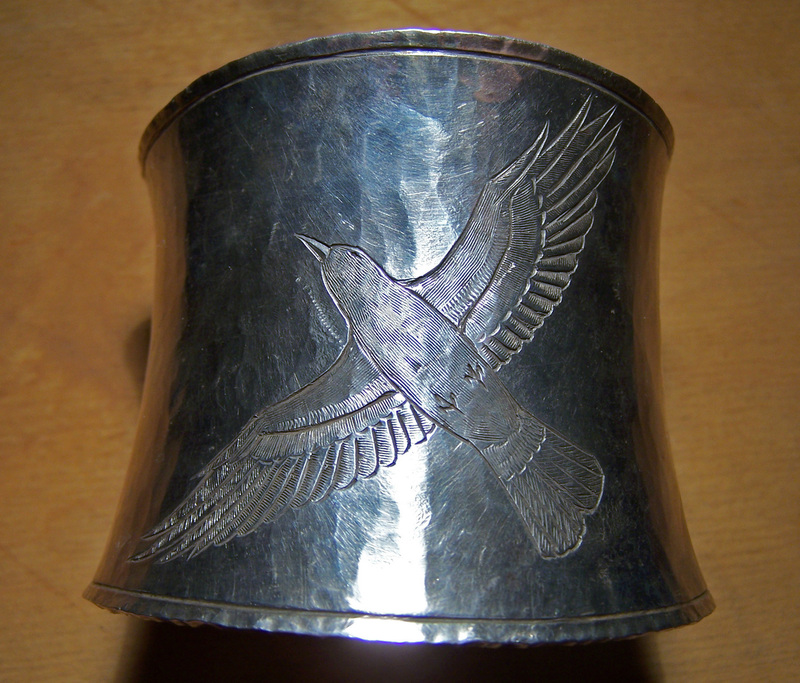 The flying crow design that I engraved on this large silver cuff is based on a tattoo on the owners wrist. I gave the whole thing a bit of a saddle shape for comfort, and engraved landscapes and basket patterns near the opening. In the Summer of 2013 I had the rare honor of participating in a very special international art exhibition. I was one of eleven artists from North America, and eleven from Japan that were invited to show their work at venues such as The Museum of Contemporary Craft, Waterstone Gallery, and Velvet DaVinci. It was a wonderful experience to have my work share the stage with that of such great creators as Kazuo Kashima, of Tokyo, Momoko Okada, of Hokkaido, Satoshi Hara, of Ishikawa, David Huang, of Sand Lake, MI, and Greg Wilbur, of Portland, OR. Not only did we have the chance to all show our work to the public, but there were also demonstrations and master classes in which we could share techniques and learn from one another. I want to again thank everyone involved in putting the whole thing together, especially Greg and Momoko. The pieces below were my contribution. For the East – West show I wanted to create something that would be recognizable throughout the Pacific Rim . The Abalone, a large gastropod, has for centuries been popular for both its delicious flesh and beautiful shell, from California to New Zealand to Japan. I have fond memories of eating them on the beach as a child. 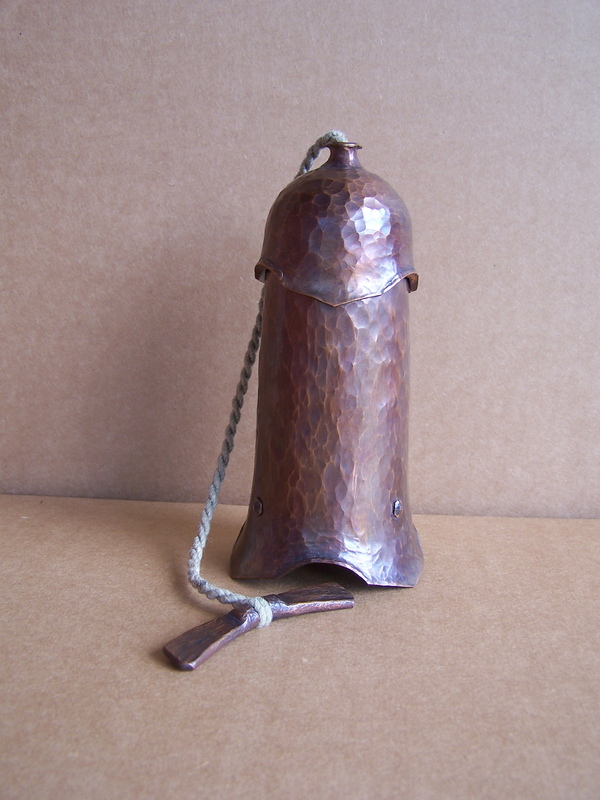 This is a hammer formed copper canister, with a lid that slides on the hemp suspension cord. 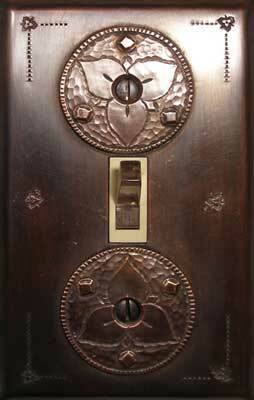 The toggle is forged in the form of a pair of maple seeds, the sort that break off and spin as they fall. One of the master classes was on line and dot inlay. 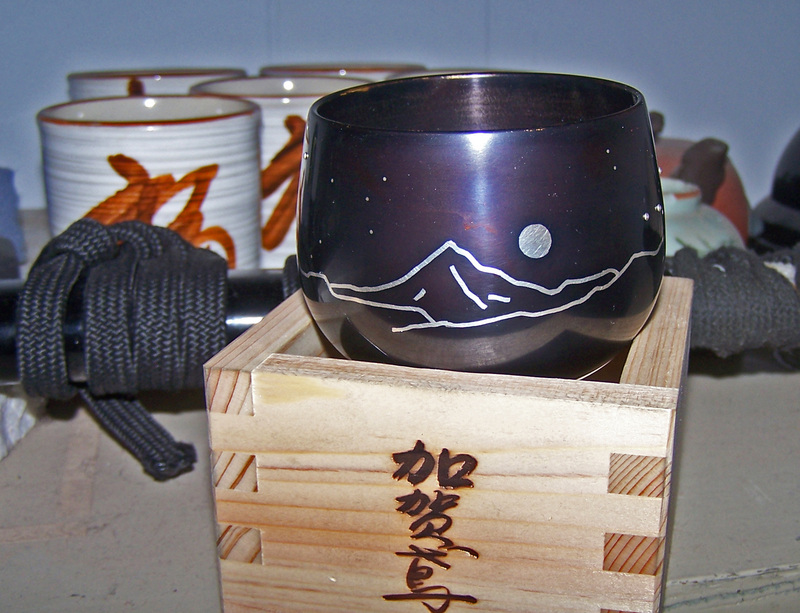 We were each given a brass sake cup, and instructed in inlay techniques. Perhaps best of all when we finished, the inlay Mr. Hara, helped us give our work a wonderful dark patina, which on brass is rather tricky. I have always loved walking on the beach, climbing on the rocks and picking up all sorts of shells and other things that wash up. 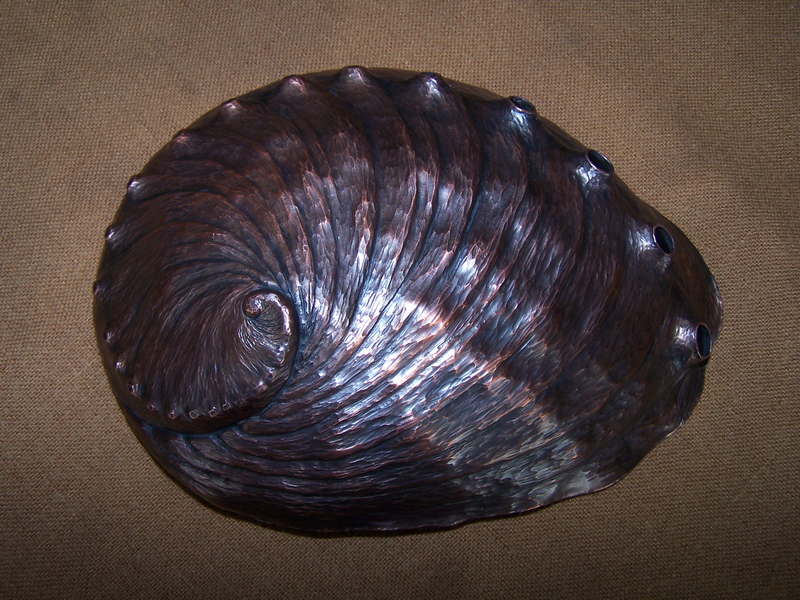 After making Sonchun, the piece pictured below, I decided that I wanted to make a copper form that related to beachcombing. It is displayed with fragments of sea shell, sponges and coral, urchin spines, and bunker coal from shipwrecks inside. All of these I gathered at Point Saint George, near Crescent City, California. In Sonchun, I hammer worked the edges creating a slight thickening in some places and thinning in others. In this piece I decided to further explore this process. I thickened the center of the bottom a great deal, as well as thickening the curved areas around the lip, while leaving the tips quite thin. I also wanted to explore some of the possibilities offered by hand working the cordage, creating eyes and junctions as I went along, rather than knotting or splicing. Here again the dentalium sets off the dark copper, and the keyhole limpet makes an excellent carrying toggle. 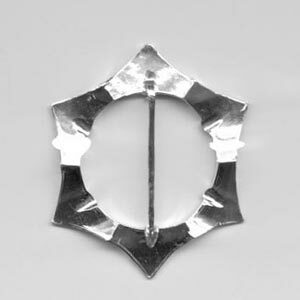 This is a sort of a follow on piece to Gushchu, which is pictured below. It was so satisfying working with copper, cedar bark and dentalium in the same piece, that I decided that I would have to explore the theme further. 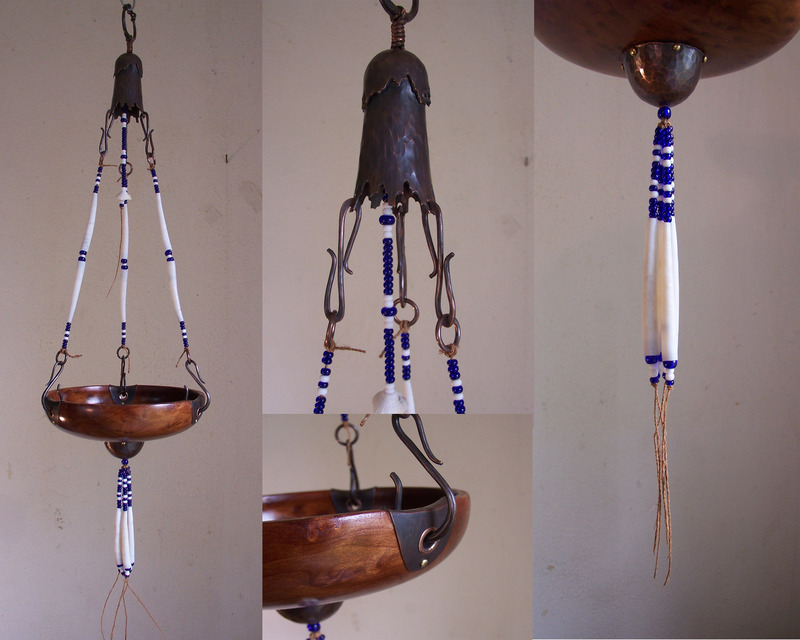 In this piece all of the cordage is made from the bark of red cedar to complement the darker finish on the copper parts. The conical top and the acorn cap shaped bottom I raised from copper sheet, working the edge details with a hammer, and making all the holes by driving a drift through the sheet, and then rolling it about to stretch the holes. Thus no metal was ground or filed away from the parts. The three clips that attach the hanging cords to the bowl are inspired by the curves of bent wood halibut hooks, and were also made without removing any copper. The same is true for the suspension loop at the very top, which turns freely in its hole. I used dentalium not only for decoration, but also to attach the cords to the conical top. This is done by running a loop of the cord through a heart shaped hole, and pinning it with a small dentalium shell. Acorns have fascinated me since I was very small, and as a child I played all sorts of make believe games with them. Sonchun is the Tolowa word for acorn or oak, and in traditional times there were many stories about both tree and nut. In much of California and Oregon acorns were a staple food. They were gathered, dried, ground, and blanched to remove the tannins that make them taste so bitter. When prepared right they make a wonderful nutty starchy mush that is great with dried fish. Nowadays I live where there are many cedars and few oaks, but I remember the big white oaks of my youth; their shade their mosses, their mistletoe. But most I remember their acorn with the smooth caps that look like tightly woven baskets. This is the second mazer I have made from copper and redwood, and this time I wanted to make a piece that was very much of the Pacific coast. The word Gushchu means Coast Redwood. In Northern California and Southern Oregon, Coast Redwood is one of the two sacred “original” trees, and is in fact very ancient. I made all the metal parts of copper which traditionally is the symbol of eternity, and attached the redwood to the copper with cordage rather than the usual fasteners. For this I twisted yellow cedar bark, and tied it with a cargo hitch. The feet are in the form of “Coppers” or “Ti-na”, the traditional emblems of wealth, status and generosity in many parts of Washington British Colombia and Alaska. 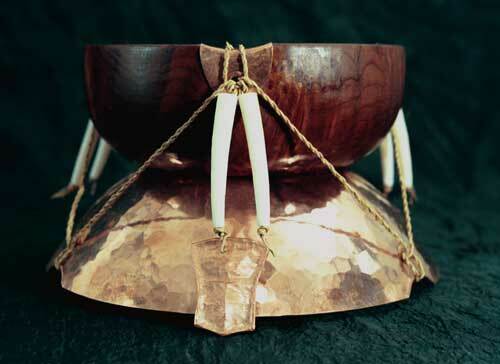 The dentalium that decorate the bowl are the traditional money from all along the Pacific coast of North America, and are still quite sought after in some places. This piece is now in the collection of the President of The Evergreen State College. When I was young I studied with a coastal native basket maker, making traditional designs in spruce root and hazel. I no longer have time to gather and process basket materials, but I still love the traditional shapes. There are ways in which raising sheet metal is similar to weaving baskets, and it lends itself to many of the same forms. 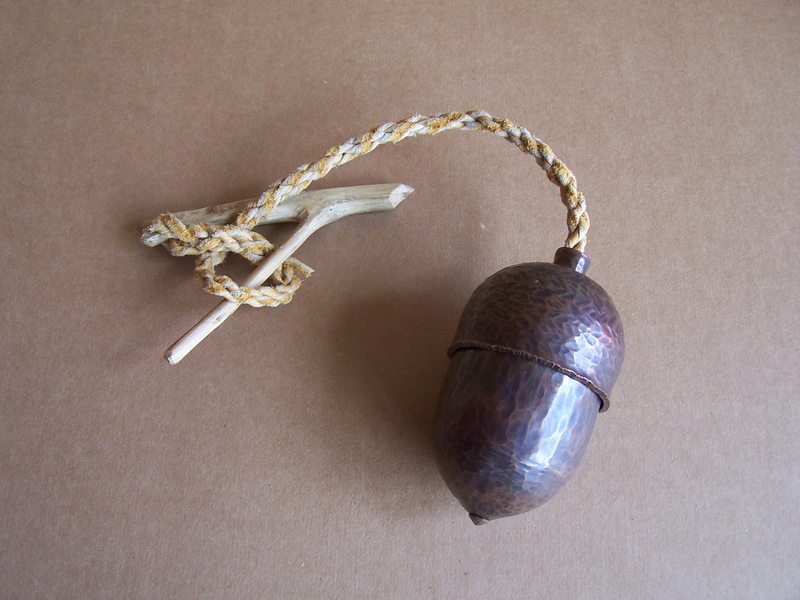 This little container is in the form of a traditional tobacco basket, complete with lid and little square spots at the centers of the top and bottom. 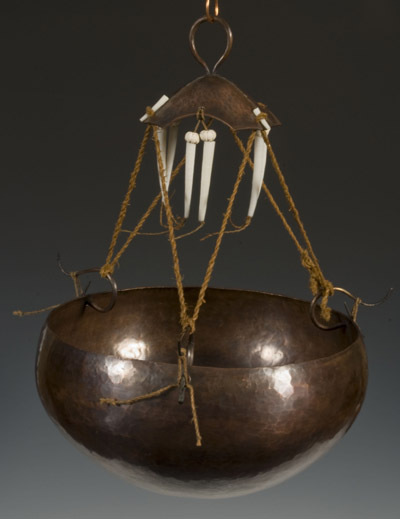 The lid is separate and held in place by a thong that runs through three loops of deerskin, and is decorated with little chips of walrus ivory. This little container is in the form of one kind of traditional trinket basket, complete with lid and a little square spot at the center of the bottom. 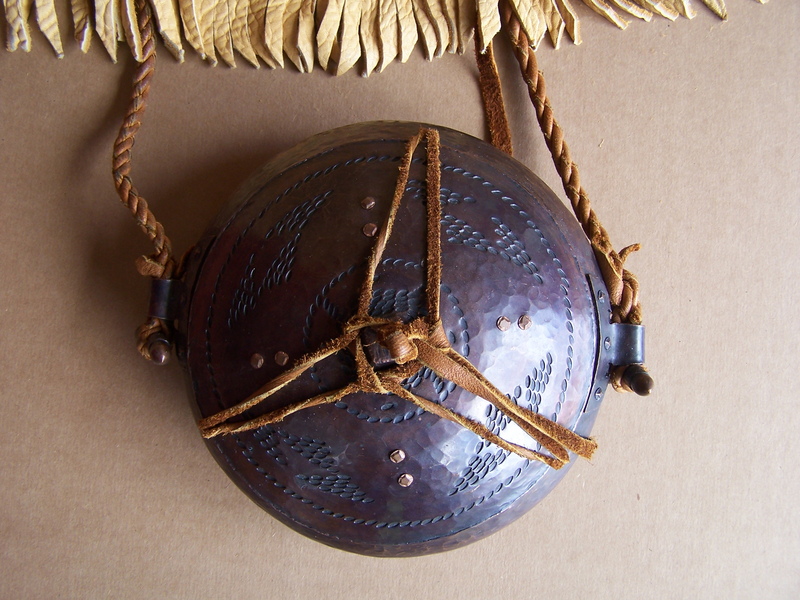 The lid is separate and held in place by a thong that runs through three loops of deerskin, with the decorations on the interior. 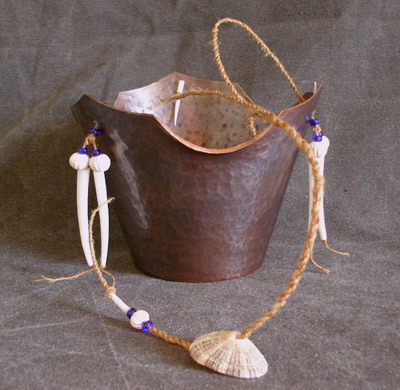 Here again I have been exploring the combining of copper, wood, shell and cordage. The top hanger is made of copper, and inspired by the ragged edges of hazelnut husks. There are two dentillia on each of the hanging cords, plus four more underneath, for a full string of ten. The bowl itself is turned redwood burl. I continue to be fascinated with vessels and containers of all kinds. 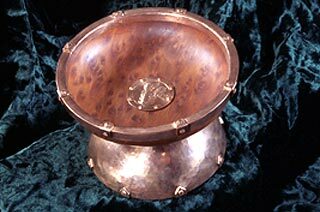 This copper canister is meant to hold coins, and is suspended from a carved oak hanger with cordage twisted from deerskin. As with the maple canister, the lid (the acorn cap) slides on the suspension cord. This vessel is in the form of a twined storage basket, and is fitted with a shoulder strap to be used as a handbag. 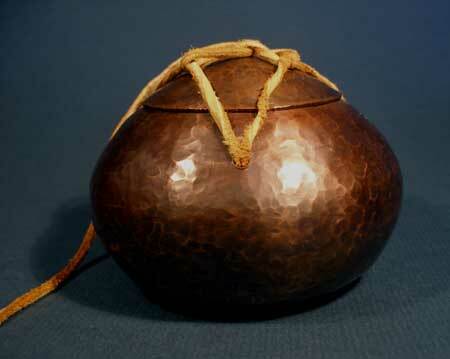 The lid is laced on with the same deerskin from which the strap is twisted, and the toggles are forged copper acorns. Inspired by the beauty of the materials this mazer has a heavy foot and is set with an engraving of a redwood branch. All the fasteners are made from square shanked copper boat nails, which secure both the foot and the engraving as well as all the retaining brackets. The bowl is turned redwood burl. 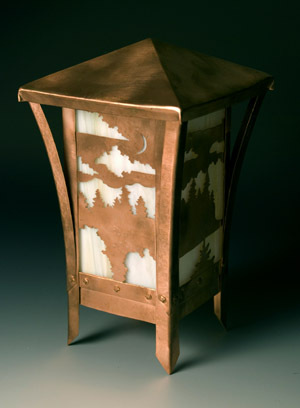 I made these as examples for a class I was teaching on contemporary domestic copper work. 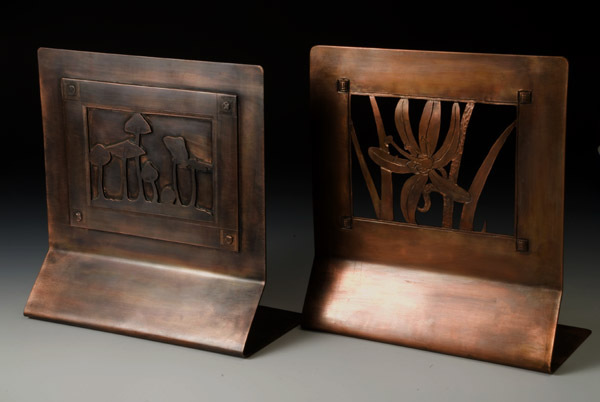 The bookend on the right has a design of a Camas flower cut through the thickness of the metal, with chased details. Camas has beautiful blue flowers and a root that has been cooked and eaten for thousands of years. The bookend on the left has its design cut through an overlay plate that is riveted in place, and has engraved details. 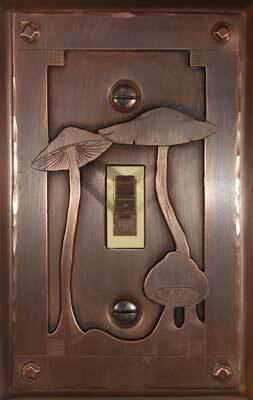 Its design features psychoactive mushrooms. Items from the Arts and Crafts period are very popular right now, and are often blindly copied, without any understanding of the principles behind them. This is especially true for the notion that domestic and architectural objects should relate to their location. I was making some Arts and Crafts post lamps to promote a class and decided to make one with cut outs of local landscapes. 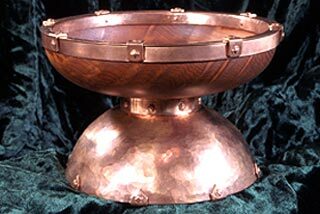 It seemed like the logical extension of the A&C ethic into my fascination with contemporary copper work. This lamp is sized to fit the top of a cedar 4×4, and the glass glows a beautiful amber color when lit. 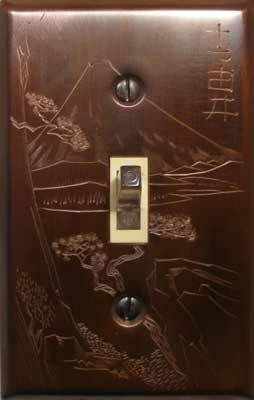 This switchplate is engraved with a landscape detail, after Hiroshige’s print of that location on the Tokaido. Landscapes lend themselves to my sort of engraving, and I am considering doing some more switchplates after the photographs of Ansel Adams. This was done with only four gravers, and I love the economy of line that is produced. More copper work will be posted here soon. Lucia was a 3rd century saint from Sicily who was known for bringing food to the Christians in the Catacombs. Her story took on pagan overtones when it went north to Scandinavia. Santa Lucia’s Day is the 13th of December, which was the winter solstice in the old calendar. Today, Santa Lucia’s Day is celebrated throughout Scandinavia with a special breakfast presented by a girl playing the role of Santa Lucia. She carries a plate of cakes and buns, and wears a crown of lingonberries and burning candles. On this tiara I have included several contemporary metalworking techniques. The band is an anticlastic form, that is to say that it has been raised so that it curves in opposite directions in each axis. A saddle is a good example of this sort of form. The edges of the band have been thinned with hammer work to produce a ruffled bordure. 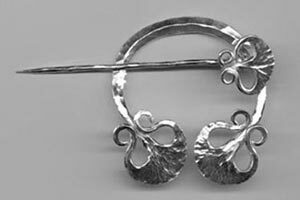 The vines are simply forged silver bar, and finally both the leaved and the wax cups are fold forms, shapes that have been produced by folding the metal, forging it and then unfolding. 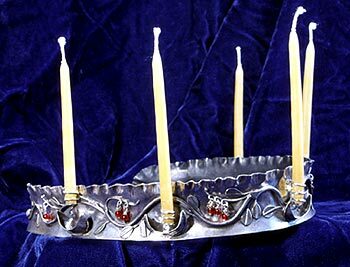 I made the candle holders coils of wire so that they could accommodate different sizes of candle. According to Norse legend, the god Odin had a magical arm ring that would generate nine new rings every nine days. The rings were then given as special gifts. These bangles are my modern interpretation of that legend. Each of the nine individual bangles is worked with a motif that matches one of the small rings through which the tenth bangle runs. See detail picture. 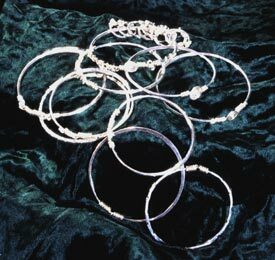 Note: Plain bangles of this sort are available in the part of this site with jewelry for re-enactors. Detail showing one bangle and one of the smaller rings. A forged form stirrup ring designed for two fingers. 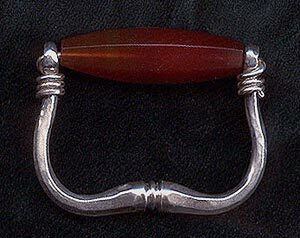 .999 silver and carnelian. Fits a hand with a ring finger that is about a size 10. These flanged and spiraled earrings are made of 22K gold and sterling silver mokume gane. 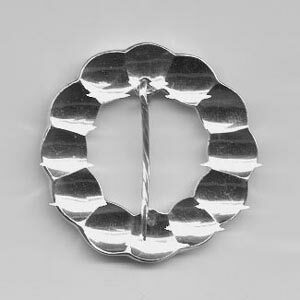 This pattern is also available in plain silver. 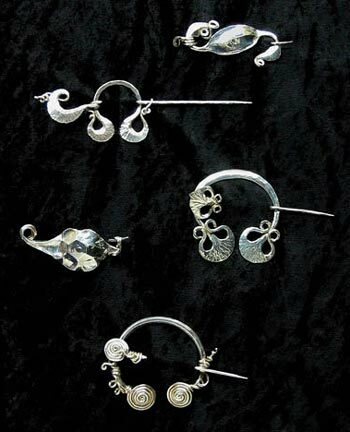 I originally came to the world of art jewelry from a background in blacksmithing. 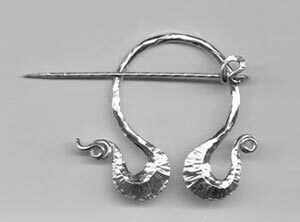 This series of hand forged brooches is a return to my roots in metalsmithing; a completion of a circle. 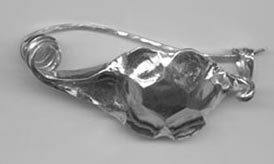 These pure silver forms are forged from solid ingots, without the use of soldering, riveting, or stock removal, and with little or no finish filing. They have been hand burnished, tumbled, and then hand rubbed with a flannel cloth. I have neither attempted to hide the marks left by the hammer, nor have I used hammer blows beyond those required to create these shapes. My goal is to not only express myself through the metal, but also to allow the metal to express its own character through my work. Note: Not all of these brooches that are yet sold; some are on display at Danaca Design Studio in Seattle, WA.